Dil e Beqara Novel Authored by Nighat Abdullah. 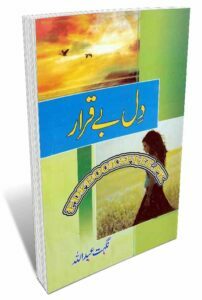 Dil e Beqarar is another tremendous novel of Nighat Abdullah which contains an interesting social romantic story in Urdu language. The story of this novel gripping on love, romance, reforms and some issues of our society in Urdu language. Urdu Romantic novel Dil e Beqarar is now available here on Pakistan virtual library in high quality Pdf document for the study of our users. Check out the following links to read online or download the complete novel in Pdf format and enjoy offline reading in your computer and android devices.